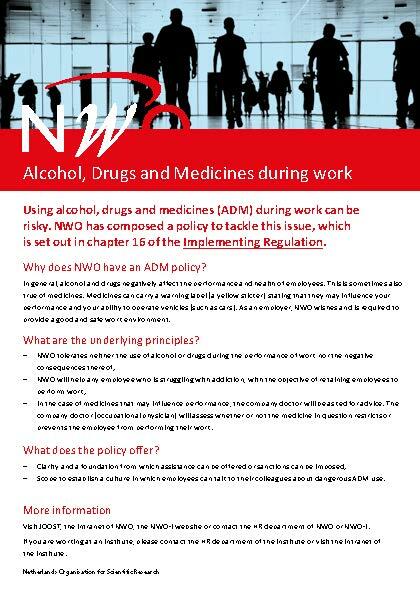 In good consultation with the central works council (Dutch acronym COR) a NWO policy about the use of alcohol, drugs and medicines (ADM) has been realised. This policy is expressed in a regulation that became effective on 1 October 2015. The reason for making the policy is that alcohol and drugs have a negative effect on the functioning and health of employees. The basic premise is that the use of alcohol and drugs cannot be combined with carrying out work duties. Examples are working with dangerous machines, experimental setups or hazardous substances. However, an employee taking important financial other decisions when under the influence of alcohol or drugs can also create major risks for the organisation and those directly involved. With this regulation NWO-I wants to prevent the negative consequences of alcohol, drug and medicine use, such as accidents, material and immaterial damage, the reduced quality of services delivered, illness, and work absence. As an employer, NWO-I must also ensure good and safe working conditions. An ADM policy is therefore an instrument that contributes to a healthy and safe working climate. First and foremost it contains room for the employer to arrange supervision for employees with problems so that damage to the employer and employee are prevented and inadequate functioning as a consequence of an addiction problem is signalled in good time. Within this ADM policy it is also appropriate that employees address their colleagues about irresponsible alcohol use, for example during informal drinks or a personnel trip, and that they take their own responsibility. In brief the policy focuses on the interests of the individual employee as well as the interests of the organisation (economic interests, safety aspects, corporate image), for which the starting point is that every effort is made to retain the employee for the organisation. You can download the entire ADM policy at the top right hand corner of this page.